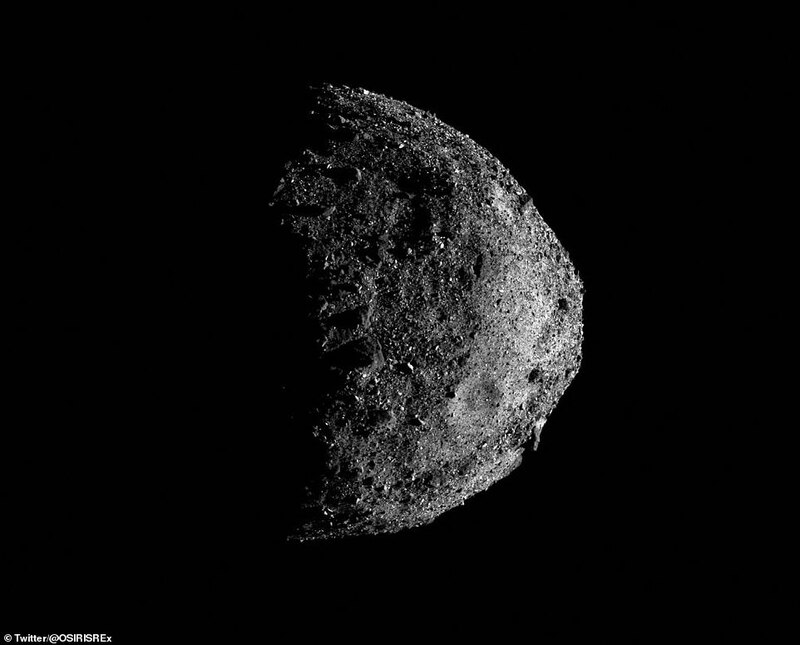 NASA’s asteroid-chasing spacecraft has released the most detailed views yet of its oddly-shaped target from more than 1.4 billion miles away from home. 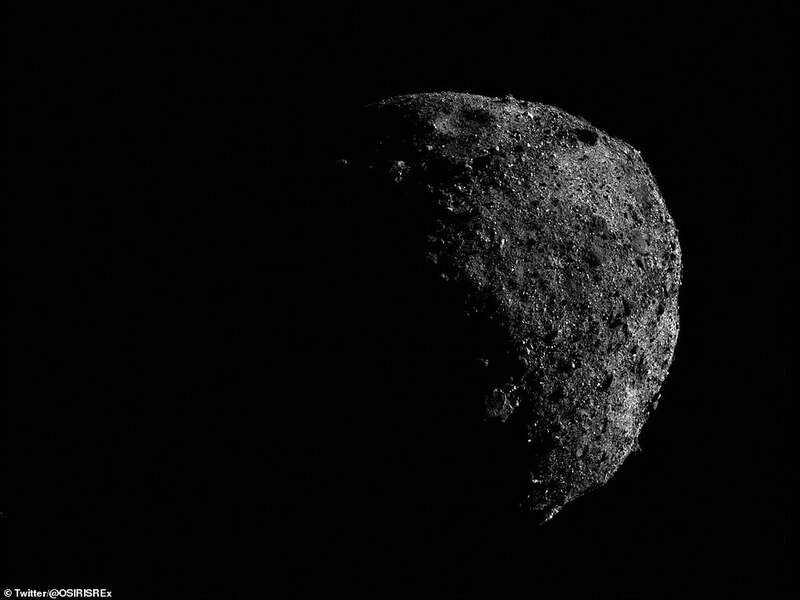 Since OSIRIS-REx reached orbit around asteroid Bennu at the beginning of this year, its snapshots have brought us closer and closer to the nearby asteroid. At just 1,600 feet across, Bennu is the smallest object ever to be orbited by a spacecraft. The latest batch of images shows Bennu in staggering new detail from when OSIRIS-REx was just one mile above the surface. Images shared on the OSIRIS-REx Twitter account show Bennu’s south pole as the spacecraft zipped by in an initial survey. ‘As I fly around Bennu during Orbital A, my scientific cameras are not collecting data,’ the account tweeted this week. 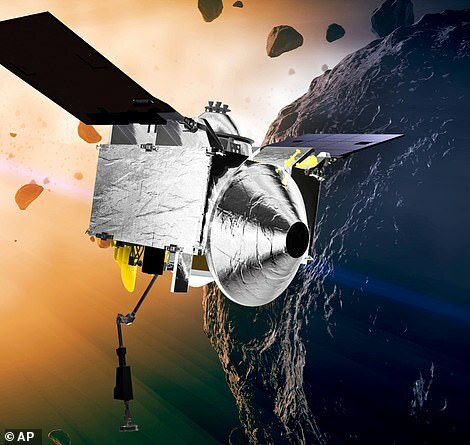 OSIRIS-REx left Earth more than two years ago on its mission to study an asteroid and, hopefully, bring a sample back home in 2023. The craft will spend the next year in orbit around its target before dropping down briefly so it can get close enough to scoop up a sample of dirt and rock from the surface. Right now, the craft is over a billion miles away. ‘For those keeping track at home…I’ve traveled just under 2.2 billon km (1.4 billion miles) since leaving home in Sept 2016,’ the account tweeted. Osiris-Rex’ ultimate goal is to bring back a regolith sample of at least 2.1 ounces. 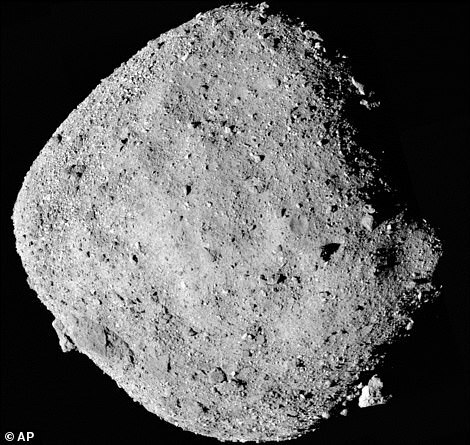 Asteroid Bennu is said to be a carbon-rich hunk of rock that might contain organic materials or molecular precursors to life. 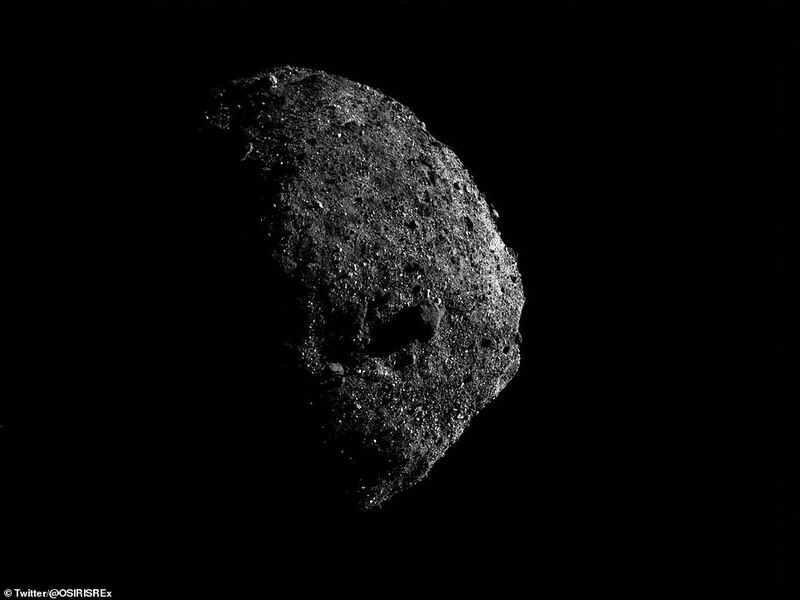 'Analyzing a sample from Bennu will help planetary scientists better understand the role asteroids may have played in delivering life-forming compounds to Earth,' NASA explains. 'We know from having studied Bennu through Earth- and space-based telescopes that it is a carbonaceous, or carbon-rich, asteroid. Carbon is the hinge upon which organic molecules hang. 'Bennu is likely rich in organic molecules, which are made of chains of carbon bonded with atoms of oxygen, hydrogen, and other elements in a chemical recipe that makes all known living things. All these beautiful photos and they still can't get a decent/clear photo of the lunar rover on the moon? because we would recognize it to be a LEGO lunar playset complete with astronots.